Morning Peeps, a new challenge at Allsorts today and Sarah is inviting us to create something to celebrate 'Milestone Birthdays'. We have Stix2 as our sponsor. My card is one I made for an order from a friend for her Mum's 90th Birthday, the brief was butterflies, flowers and the word 'Mummy' in the sentiment. So I used Timmy's one the edge butterfly border for the edge of the card and then cut the butterflies again on vellum, which I then over stamped with a script stamp and heat embossed with pink WOW embossing powder. The lilies are Penny Black 4383K First Dance and some more script into the background and a little shading with Pan Pastels. I also made a acetate topped box and tied some matching ribbon and a rose. I am told 'Mummy' loved the card and she explained that it's many, many years since she called her Mummy but as a child always called her that rather than Mum when she had been told off, so she knew it would make her Mum smile. As most know I rarely enter challenges but I do try to make an exception for the Butterfly Challenge, although I have not not entered for a while. So am going to enter this into the current Butterfly Challenge which is Paper Pieced Butterflies. Now I am not a 100% certain the way I have used the vellum on the butterflies is strictly paper piecing as it's only stuck in the middle, so apologies if it doesn't quite fit the brief and I will understand if I am not eligible. Good morning from the very chilly Fens, I hope you are all keeping warm. Another hard frost last night but it does look beautiful and prompted me to change my blog header to a photo taken last Winter looking across the Fen from the paddocks when you get those wonderful early morning pink skies. Before I tell you about my pieces of artwork, I would like to thank everyone for their kind words and recent comments, I believe the new meds are working, still nasty side effects but I can learn to live with that if the pain eases. 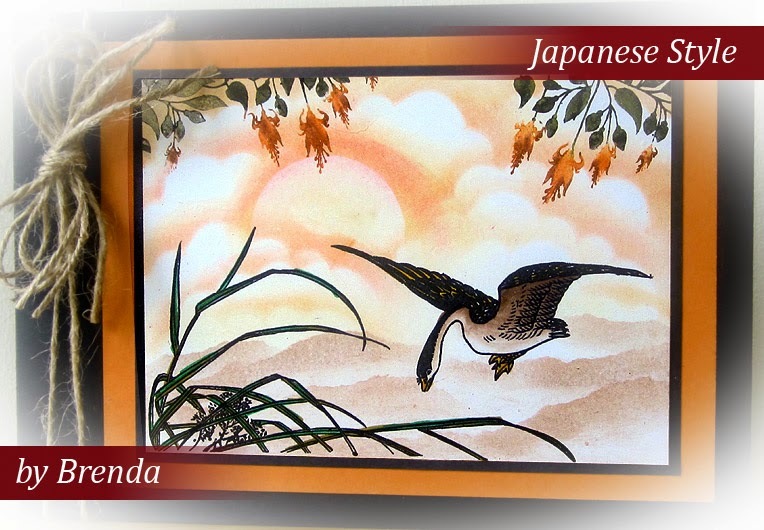 On to some artwork and this week I have been playing.........oooops I meant working............with Ignacio's latest Nicecrane Designs which are Japanese themed and can be found here. 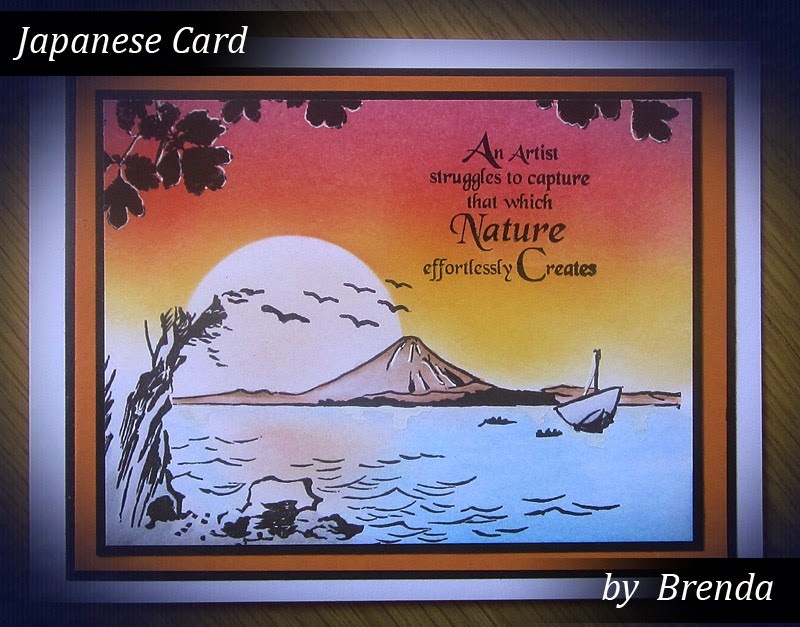 As we all know I am not great at colouring in, although it is coming along with my new Chameleon pens, so I decided to use those on the Oriental lady below and turn the rest into some of my favourite scenic cards. The top card is probably my favourite of the scenic ones, I love strong and vivid skies which are so easy to achieve with Pan Pastels and of course suns and moon, a sun on this one plus a few leaves across the top and some white highlighting here and there. 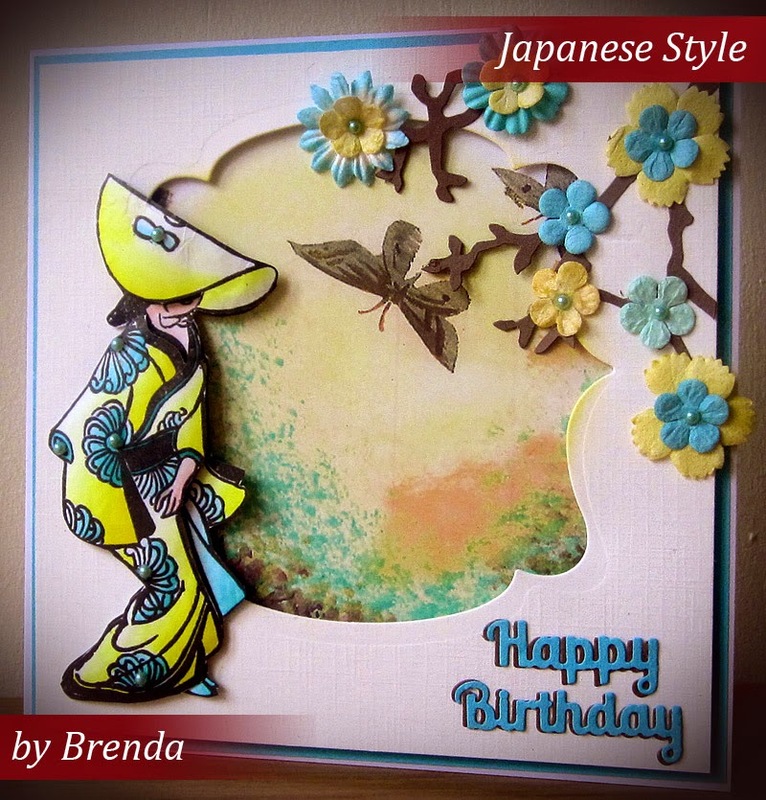 I used one of the designs from the Vintage Butterflies set as the background in the aperture, what I so like about all of Ignacio's Vintage designs is that you can always find something to coordinate or compliment other designs. My Oriental lady was coloured with Chameleon pens and does look rather yellow, but in real life is a tad more subtle. The sentiment is another from All Occasion Dies, cut twice to achieve a shadow effect. Pan Pastels again for this one and a few Lavinia flowers stamped across the top using distress markers and garden twine down the side to carry the rustic feel of the card. I rather liked the splatter background on my Penny Black card last week so stuck with the same colour Dylusions for this one and painted the butterfly and flowers with them as well with a final brush over with Glimmer Mist pearl, it works wonders to soften the fibers so you can mould them into shape. The sentiment is Penny Black. Have a good Tuesday Peeps. A very good morning to you all, today at Allsorts it's my turn to host the theme and I would like to see creations that feature no design papers. 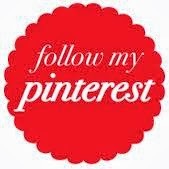 Our sponsors are my friend Ruth from A Passion for Stamps and another friend Ignacio from Nicecrane designs. So as I am on the DT for both it means two cards from me. My Nicecrane piece above uses one of the lovely Birds and Blossoms images.............can you tell I am already thinking ahead to Spring............a background of Dylusions, then script and grids randomly stamped, a Timmy clock onto which I scattered some Frantage, dies cut leaves, some twine, hessian and corner embellies. My Passions for Stamps card uses the pretty Christmas Rose to which I added just a little colour using my Chameleon pens, inked the edge of the card along with some white Frantage, a Penny Black sentiment and some simple matting and layers. Much as I like Design Papers and have some beautiful ones, I think sometimes they detract from the focal image and to me this card demonstrates exactly what I mean. Good Morning Peeps, I am here with some more Nicecrane Design creations and also my mid month Penny Black and More card. Thank you for your kind comments and messages. I am in a bit of a MS relapse at the moment and walking and standing is painful but now have some new meds although they are making me like a zombie....... but not too much new there I guess......... and nights are like a war zone with the hallucinatory affects of them. But there is of course a positive side, I am having to sit most of the time which means I can craft for England ! On to my work and I think lots of you will know what I mean when I say you see a stamp or image and can immediately visulise the card you are going to make, well the beautiful image on the top card was one of those, she is such a little angel. I could see her decoupaged and standing in an aperture with little added colour other than some gold glitter on the Christmas tree and some die cut stars, she is far too pretty to fuss with. 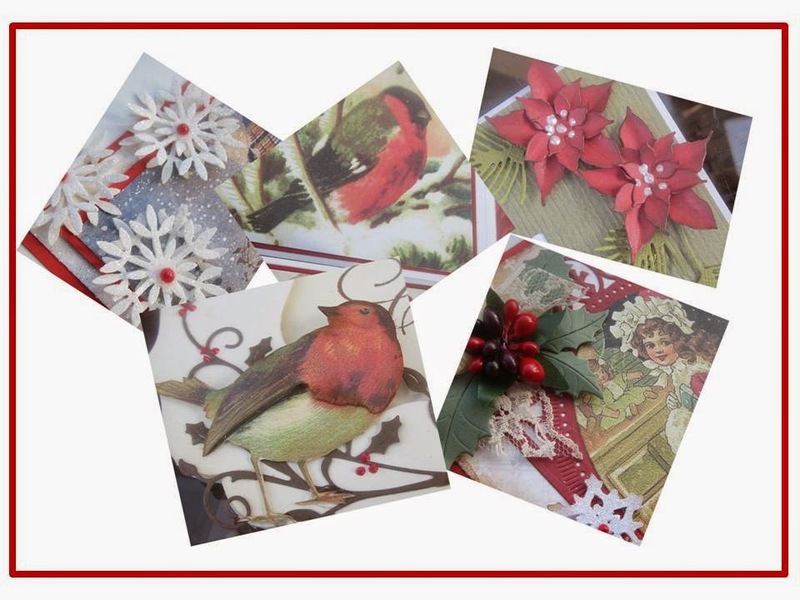 She is one of the images from the Vintage Christmas saver pack, great value at $4.50 for about eighteen images. I have used a new stamp for my Penny Black mid month card called Jubilant 40-286 stamped onto a 'splatter' background.....very technical term here aka messing about with Dylusions. I stamped it twice to decouapge the main flowers which are pained with Dylusions, the leaves have been coloured with Chamelion pens. The sentiment is from the Special Wishes set 30-229. I absolutely adore this image, not only the colours but the little girls angelic face. She is from the Children in Victorian Age 111 design set. The frame is from Tonic which I randomly stamped with distress inks before making up and then rubbed over with a couple of colours of gilding wax. This card has one of the eight designs in the Adorable Christmas design set teamed up with Penny Black Reindeer dies and an embossed frame with I coloured with gilding waxes. The sentiment on this card and the one at the top is from All Occasion Dies, clever sets as the Happy comes in a set in two sizes and the Christmas in another sets again in two sizes and then there are also Birthday, Anniversary and so on and they all mix and match and at between £4.40 and £5.50 a set great value for money. Saturday morning and a new challenge at Allsorts and this week our lovely Tracy Mouse is challenging us to create 'Anything but a Card'. 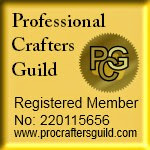 Our sponsor this week is Yours and Mine Papercrafts. Before I tell you about my makes I need to extend an apology for being such a bad blogger this week, my body seems to be going through one of it's painful periods and energy levels and appetite almost zero. Fingers crossed things pick up in the coming days, but meantime thank you for your kind visits despite me being so inactive. When Tracy knew I had been to the NEC last week.......I would hasten to add it was a rather impromptu and quick visit and I was in and out in about three hours..........and knew I had bought some goodies from the MDF man and a marbling starter kit she said she expected to see both MDF and marbling for her theme, so of course I had to oblige. The hanging above is actually something I made a few weeks ago as a DT piece for Stamp Addicts so I was part way there. 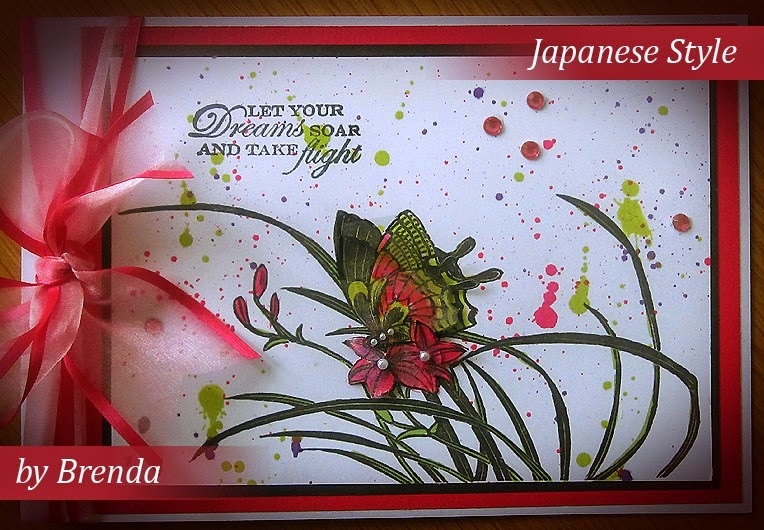 I used a mixture of their stamps including grunge flowers, grunge background, script background and swirly tree. The hearts were painted with acrylic paints first then covered with crackle glaze followed by various inks and gilding waxes. The second piece is a test run using my new marbling starter kit, the first attempt was OK'ish but the box was made of Kraft and looked rather dark with the ink colours I chose which were black, blues and red, so I decided to give lilacs and black a go with a white box and am much happier with the outcome. I've not got as far as trying out flowers and more defined patterns, that will be some inky fun another day. I am still playing Photoshop and trying to get properly to grips with it and have created a little collage with close up's of the above box and tag. Morning Peeps, it's Saturday so that means a new challenge at Allsorts and this week Susan has chosen a very appropriate theme of Poppies and/or Remembrance. Our sponsors are Cuddly Buddly and Marianne Designs. It's no secret that I adore Poppies and probably have far more Poppy stamps and dies than is healthy. The Poppy image I have used today is a newish release from Penny Black 40-311 Poppy Trio, stamped onto a background of Dylusions and stenciling using Penny Black 25-001 Promenade. The sentiment is Penny Black 1483E Cherish Yesterday which I masked and stamped to break down into three.......the writing is too close to just stamp and cut into sections but it's easy enough to do this way with trusty post it notes as masks. Good afternoon Peeps, popping in to share some Nicecrane Designs Christmas cards which I meant to add to my post on Monday but forgot........nothing new there then I hear you say. I should also answer a question quite a few have asked me which is how to vote for me in the card design section of the British Craft Awards, I understand it's all done alphabetically so means some nominees don't make it into the listings so have to be voted for as an 'other, being a 'W' surname I am one of those ! But imagine Brenda at Floral Fantasies will work. Most of Ignacio's sets are priced from $2.44 to $4.50 and when you consider most have five or six different designs in each they are great value for money and if you have a lot of Christmas cards to make and want to make them all a little bit different they are the perfect solution to your Christmas crafting. 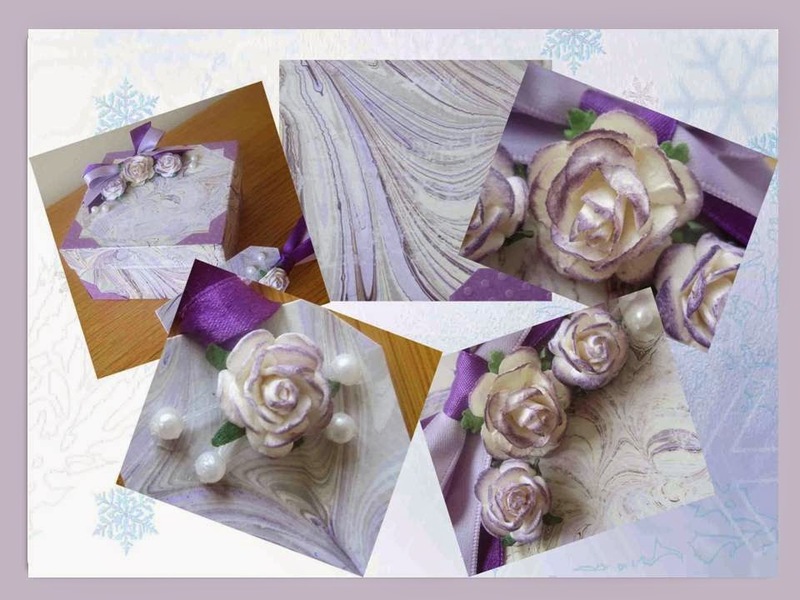 Although I am a stamper first and foremost, what I particularly like about Nicecrane Designs sets is that you can make your cards as simple or as elaborate as you wish and also incorporate stamping as I have done in the top card. The card at the bottom of the post which was a recent Penny Black DT piece is another example of combining them with stamping. There are links to all the design sets I have used under each photo so you can pop over to the store and have a browse and there are lots more designs in the Christmas section. Have a good Wednesday everyone and thank you for popping in. The first Monday of the month and time for a new challenge at FlonzCraft Vintage Stamping Challenges where our November theme has been chosen by yours truly and it's 'Anything but a card'. 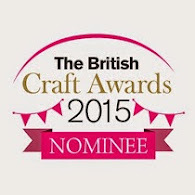 As always there is a great prize from FlonzCraft and the opportunity to choose some lovely stamps. When I chose the theme I wasn't sure what I would make but the idea came when I was at a show recently and saw some chipboard fans on the Tando stand. The pack contains two in different different sized, this is the smaller about 7" x 5". Each come as two parts and the top ones has push out sections so you can layer the fan to given dimension. I masked the bottom part and painted alternate sections with brown and aqua Fresco acrylic paint and then stamped with two different Flonz stamps, Butterfly branch and Apple blossom using detail gold embossing on the aqua and Judikins aquamarine sparkle on the brown. The top section was painted with Adirondack gold dabber and 'fluffed' up to give a dappled affect and nice metallic sheen. Finally I threaded some beads and made a tassel to thread through the hole - there is not a hole in the template but my Japanese screw punch went through a treat. I do hope you will join in our challenge this month. 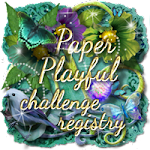 Time for our monthly challenges at Stamping Sensations and Penny Black and More where our themes are 'Simply Christmas' and 'Anything Goes'. For my Penny Black and More piece I have masked a panel on a piece of Centura Pearl (reverse side) and also a masked sun, shaded with Pan Pastels and stamped Penny Black 3937H Birds on a wire, 3940F Life and 3948 Fireworks and simply matted and layered onto coordinating Bazzil added some Swarovski crystals and added a bow down the spine. You will find all the stamps listed above and below on Penny Blacks website here, where you can sign up to their free club and follow them on Facebook. I have used a mixture of stamps on my Stamping Sensations card, Art Impression, Lavinia and Penny Black, all stamped in black archival and the background created with a mixture of inks and Pan Pastrels. I cut the frame on the Cricut, embossed and them rubber with gilding wax and finally a few red berries using stickles. And just the one more as I wanted to use this new Penny Black stamp while there are still hints of Autumn about. At the same time I tried out the new Pebeo drawing gum which I am so pleased to say works a treat creating a mask to use with Dylusions and wet sprays and no seeping under the mask as with paper and sticky film masking sheets....result at long last ! I heat embossed the tree from Penny Black called A Day in Autumn 40-359 with detail copper, stamped some of the branches again across the bottom, distressed and embossed the edges. The words are single words taken from a couple of Penny Black sentiment sets 30-140 Christmas Cheer and 30-229 Special Wishes and the stenciling in the background is Penny Black Verdana 25-003. Lots of lovely prizes t be won at both challenges so I really hope you will join in. Good morning Peeps, time for this weeks Allsorts challenge and this week Mervi would like to see some Masculine cards. 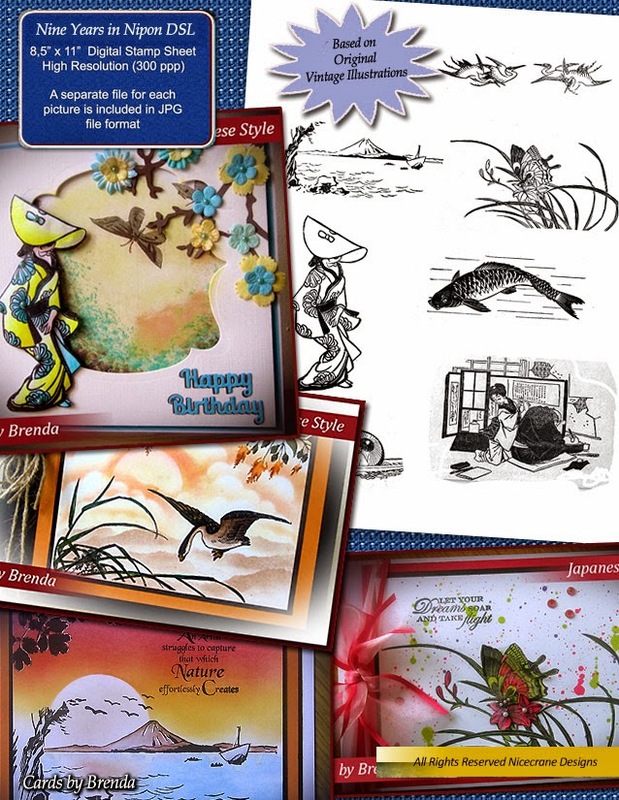 Our sponsor is DigiStamp Boutique. It's another Autumnal card from me, one I made for our eldest son who has just been promoted again, this time Chief Superintendent of Crime, so we are very proud parents again. I have used my normal Pan Pastels, Stampscape, Creative Expressions and Inkylicious stamps, an embossed base layer and a computer generated sentiment. To create the two layer effect I masked two pieces of card and created two identical pieces, cut one down slightly and then layered one over the other.